Mystery Pollster: Not Such An Outlier After All? Not Such An Outlier After All? The Diageo/Hotline Poll...(story, press release, full results) shows a very different result for the Bush job rating: 50% approve, 47% disapprove. Is this, as our friend Professor Franklin asks, "a fluke or a harbinger?" MP guesses it's the former (and Franklin appears to agree), but let's take a closer look. Finally, [the Hotline's Editor-in-Chief Chuck] Todd points out that for comparison we have only one other conventional poll fielded in the same period. He has a point. It is certainly possible that the Fox poll was the outlier on the Bush job rating, or that the reality last week fell somewhere in between. Since the President made quite a bit of news over the weekend, we may never know for certain. Nevertheless, if the next round of national surveys shows a surge in the President's job rating back to the high 40s or low 50s, MP may have to concede Todd's point. Advantage, Mr. Todd. A new national poll is out tonight from ABC News (summary, full results) and the Washington Post (article, full results), and it suggests that the Hotline poll may have been more of harbinger than a fluke after all. The ABC/Post survey shows the President's job rating at 47% approve and 52% disapprove, up from 39% approve and 60% disapprove on their last survey in early November. We should keep the field dates in mind, of course. The ABC/Post survey was conducted from Thursday through Sunday nights last week. The Diageo/Hotline survey (50% approve) was conducted Sunday and Monday last week. The Fox News/Opinion Dynamics survey (42% approve) was in the field on Monday and Tuesday nights. MP forgot a few things over the weekend. It is always dicey to compare polls of one organization to those of another, and the "snapshot" for any given week is an imperfect predictor of the snapshot to come next week. 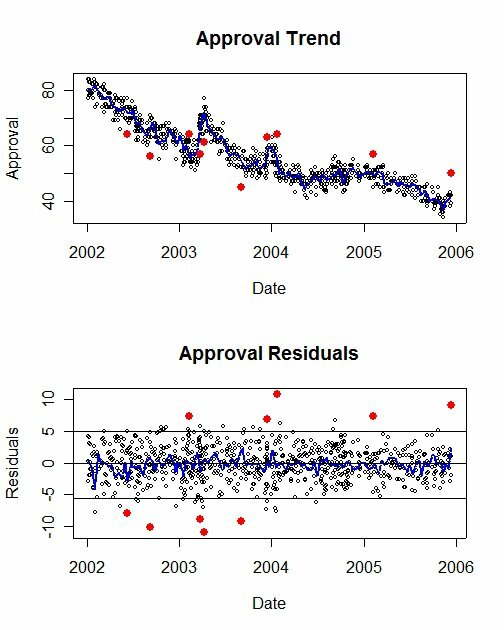 In hindsight, the safest conclusion about the reality of the Bush job rating last week was also the most statistically likely (especially without any obvious skew in partisanship or political ideology in the Hotline and Fox surveys): Among registered voters, the Bush job approval rating was somewhere in between the levels measured by the Hotline and Fox News polls. The average of the two was 46% approval, one point lower than what the ABC/Post poll released tonight (47%). Bush's pre-Christmas rebound was largely fueled by a sharp increase in support among his core supporters. In the past month, the proportion of Republicans approving of the president's performance increased by nine percentage points to 87 percent. And among conservatives, three in four said Bush was doing a good job, up 12 points from November. Among Democrats, independents and moderates, Bush's support remained unchanged or increased only modestly. The other cautionary note for the administration is that Bush's approval ratings and public optimism about Iraq have spiked in the past after instances of positive news, such as the capture of Iraqi President Saddam Hussein or last January's election, only to recede later. However, the gains in the latest poll represent a larger one-time jump than on previous occasions of favorable news from Iraq. Currently, 54 percent say they're optimistic about the situation in Iraq, up from 46 percent a year ago. Back to my point yesterday about outliers. To paraphrase from Little Big Man: Sometimes the magic works, sometimes it does not. But in the art and science of political polling, it tends to work a lot more often than not. Franklin's charts make that point vividly. Yes, outlier's happen, but better to wait to see what the next few polls look (rather than just those from last week) before judging any given poll a "fluke." Apologies to the Hotline and their pollster Ed Reilly (Financial Dynamics). LATE UPDATE (12/20): Hmmm...The polling story this week gets murkier and murkier. Gallup also released another survey last night (Gallup release, USAToday story & full results, CNN story) and, in apparent contrast to the surveys from ABC/Washington Post and Diageo/Hotline, they show no significant change in the Bush job rating over the last two weeks. The Gallup poll puts the president's job rating at 41% approve, 56% disapprove, essentially unchanged since two surveys conducted earlier in the month. The ABC/Post and Gallup surveys appear to show very different trends in ratings of President Bush's handling of "the situation in Iraq." The ABC/Post survey shows Bush Iraq approval rating increasing from 36% in early November to 46% now. The Gallup poll shows his Iraq approval rating at 37% now, just two points higher than on a survey conducted in mid November. One possible clue to these differing trends is this line from the ABC News summary: "Republican self-identification is up six points, to 33 percent of the public." As of this writing, the Washington Post has not yet released results for party and sample demographics (as it has for other polls in 2005). On its last two surveys, the ABC Post polls showed a four point Democratic edge in party ID (31% to 27%). [UPDATE: The Washington post demographic summary is now online and it shows a one point Democratic edge (33% to 32%) on party identification]. Gallup reported party identification for this latest survey at 31% Republican, 32% Democrat and 36% independent. That mix is roughly the same as their average party identification result for the last three months (32% Republican, 33% Democrat, 34% independent). I'm still putting my money on the significant upturn to about 42-43%, and holding off on bets in the high 40s. For now. One more piece of the puzzle to consider: The Rasmusssen automated survey shows no discernable trend during December. The current results (46% approve, 52% disapprove) is just one percentage point higher than their average for the month (45% approve, 53% disapprove). I will be taking a closer look at the Rasmussen trends in posts to follow later this week. I think its safe to say that, at least in the short-term, there's been some pretty substantial movement at Rasmussen.